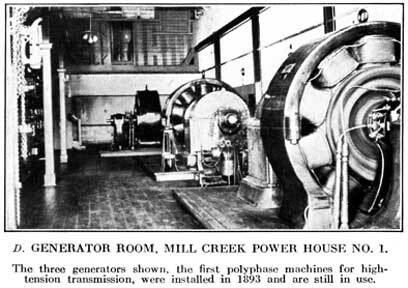 The Mill Creek plant transmitted three-phase power 8 miles to Redlands, CA at 2400 Volts. The first major customer was the Union Ice Company. They could manufacture ice and ship it to Los Angeles cheaper than it could be produced locally. The Power Company continued to expand and innovate with high voltage power transmission.